Sen. Patrick Leahy said Wednesday he's considering reversing course and voting against confirming John Brennan to lead the Central Intelligence Agency. The Senate Judiciary Committee chairman said he'd do so to protest the Obama administration's continued unwillingness to provide his committee access to top secret legal memos justifying the use of drone strikes against American citizens abroad. "I may cast a vote that would be a shot across the bow," Leahy told Seven Days Wednesday afternoon. The move would be a dramatic reversal for Leahy, who said in January that he'd back Brennan's confirmation. It comes as a small group of Republican senators, led by Kentucky's Rand Paul, spent the afternoon filibustering consideration of Brennan's confirmation. Asked whether he'd informed the White House of his change of heart, Leahy said he hadn't. "I'll probably let them figure it out," he said. Leahy has long sought access to the Justice Department memos. He first pressed Attorney General Eric Holder on the subject shortly after the CIA killed the American-born cleric Anwar al-Awlaki in a September 2011 drone strike in Yemen. Last month, the administration agreed to provide access to members of the Senate Intelligence Committee when they threatened to stall Brennan's confirmation, but it continued to decline Leahy's request. Earlier Wednesday, Leahy reiterated that request to Holder at a Judiciary Committee oversight hearing. Vermont's senior senator said he was also considering subpoenaing the Justice Department for the memos. In his opening remarks at the hearing, Leahy said he remained "deeply troubled" that his request continued to be denied. "I am not alone in my frustration or my waning patience," he said. "The relevant Office of Legal Counsel memoranda should have been provided to members of this committee. It is our responsibility to ensure that the tools at government's disposal are used in a way that is consistent with our constitution, laws and values." Calling himself "sympathetic" to the request, Holder nevertheless declined to commit to providing access to the committee Wednesday, saying it was not entirely up to him. Vermont's other senator, Independent Bernie Sanders, said Wednesday afternoon he plans to vote in favor of Brennan's confirmation. 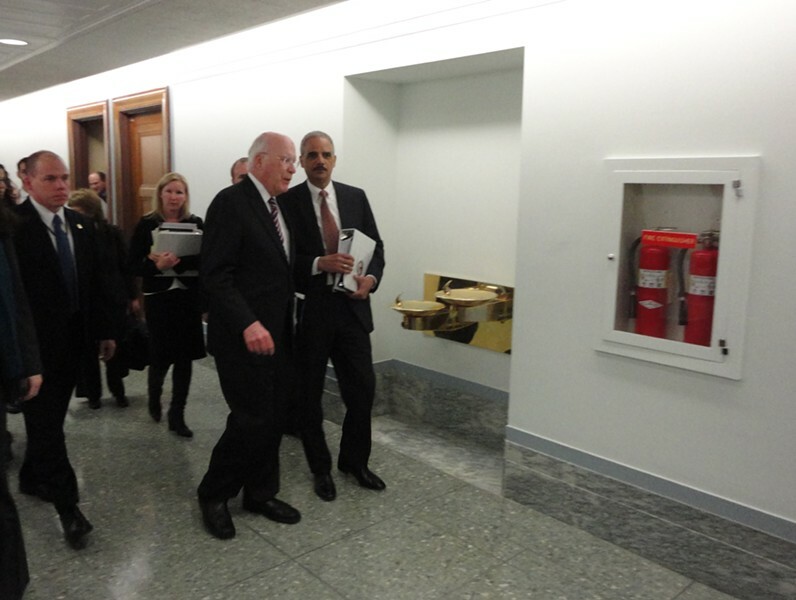 Photo of Leahy and Holder conversing after Wednesday's Senate Judiciary Committee by Paul Heintz. Note: Seven Days is in Washington, D.C., this week covering members of Vermont's congressional delegation.